Defense Minister, Chief of Staff and IAF Commander discuss details of operation after Security Cabinet meeting. After a lengthy Security Cabinet meeting, Israel's military leaders spoke about the road ahead for Operation Protective Edge, which has already hit 930 terror targets in the Hamas enclave of Gaza. "Hundreds of targets have been destroyed including the homes of militants, government institutions, launchers, rockets and other war materiel," said Defense Minister Moshe Ya'alon after the meeting. Thanking the IDF for its firm defense of Israel, Ya'alon remarked "the IDF has impressively succeeded in intercepting the rockets being launched at the State of Israel, and in thwarting the terrorist organizations' malicious intentions to perpetrate attacks, both by sea and in other ways." "But this is also the opportunity to express appreciation to the residents of Israel. ...The stamina of the public is an important component in our ability to continue the operation," said Ya'alon, calling for the public to follow instructions from the IDF Homefront Command. The IDF sent phone warnings to 100,000 residents of Gaza to leave the security border area on Thursday afternoon, in what is anticipated to be an indication of an imminent ground assault. Speaking about the goals of the operation as it appears to be about to enter a new phase, Ya'alon concluded "we will continue with this operation until we reach the desired result - the cessation of firing and the lifting of the threat to Israeli citizens and soldiers." 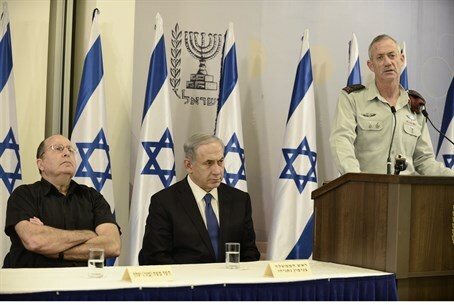 IDF Chief of Staff Lt. Gen. Benny Gantz also spoke about the operation after the meeting, noting "we will continue to follow the directives of the political echelon." "We will continue to monitor the intelligence reality. We will continue to act patiently and with sagacity. We will attack wherever it is necessary to attack, we will defend wherever it is necessary to defend, and we will attack and defend on land, sea and air," added Gantz. Up until now, the majority of the action in Gaza has been taken by the Israeli Air Force (IAF), which has conducted pinpoint airstrikes on the homes of terrorists, weapons storehouses and rocket launching sites, among others. "We have dropped hundreds of tons of ordnance and bombs on terrorist targets in the Gaza Strip, in a very complicated environment in which civilians are being used as human shields and we are trying to avoid hitting civilians as much as possible. Until now the results have been very good and we are continuing the effort," said Commander in Chief of the IAF Amir Eshel. Indeed, a senior IDF source told Arutz Sheva on Thursday that the rampant use of human shields by Hamas is hampering the airstrikes, and making a ground offensive inevitable. Eshel noted that in addition to the offensive capabilities displayed in the airstrikes, IAF personnel are also helping to man the Iron Dome anti-missile defense systems in order to defend the nation. "Until now the results have been good, most rockets are being intercepted and are not causing damage; a minority of them are hitting in settled areas. Nothing is 100% but these soldiers are professionals and are doing their work in a level-headed and determined manner, in short timeframes," said Eshel. The IAF commander concluded "the entire Air Force is involved in this effort, both offensively and defensively, and we will succeed."